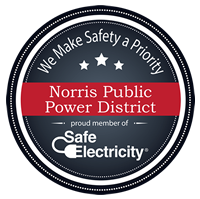 All Norris customers who provide the District with an email address will receive a free copy of the bi-monthly Norris Public Power District E-Newsletter. The E-newsletter is used as an additional source of communication with customers for safety tips, energy efficiency tips, as well as a way to communicate time sensitive information to our customers. You can view past issues of the E-newsletter by clicking on the links below.